The city is located 90km north of Bangkok and is the former capital city of Thailand. (1350-1767). 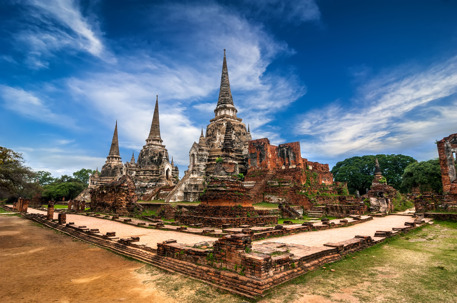 Ayutthaya was founded by prince U-Thong in 1350 at the location where the three floods, Lopburi, Pasak and Chao Praya comes together around a smaller island. The city was therefore very easy to defend against attacks from the Burmese because you could consolidate it by digging a smaller canal. During 417 years Ayutthaya was an impressive capital, one of the far east most fabled cities with over 2000 golden rods. In that time, the city was bigger than London or Paris. The area of the city was 15 square kilometres and included lots of beautiful temples and palaces that was tied together through small canals. Unfortunately it was all destroyed by the Burmese in year 1767, and the first king of the Chakri Dynasty abstained from restoring the city and moved the capital to Bangkok instead. Today the former grand capital city lays in ruins and only the leftovers from the earlier wat can testify about its past. However, those ruins are well worth its visit. The area of these ruins is overwhelmingly huge, it is recommended that you participate in any of the guided tours or find a local “Tuk-tuk” driver to guide you. The ruins have big distance between each other and between 11:00-15:00 there is hardly any shadowed area to access. The area contains more than 50 buildings and some of the attractions is located outside the island. You can also charter a “Longtailboat” and see the temples that are located along the river. The boats depart from the jetty that is located by the Chandrakasem palace. You can also access the island by foot, by crossing the Pridi Damrong bridge that you find close by the railway station in Ayutthaya.